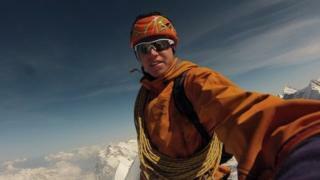 A helicopter search team has been looking for a British climber who was reported missing on a peak in Pakistan. Tom Ballard and Italian climber Daniele Nardi last made contact on Sunday, from an altitude of about 20,500ft (6,250m) on Nanga Parbat. A statement on Mr Nardi's official Facebook page, written in Italian, said a tent and "traces of an avalanche" had been spotted. Bad weather and tensions between Pakistan and India delayed searches. Experienced Pakistani mountaineer Ali Sadpara, who is the only person to have scaled the peak in winter, is on board the Pakistani army helicopter. According to Mr Nardi's Facebook page, Mr Sadpara announced that a three-person tent "invaded by snow" had been detected by the helicopter after a second search. The team added that it was "waiting to receive additional photographic and video from the base camp and Pakistani aviation". Mr Ballard, originally from Derbyshire, is the son of Alison Hargreaves, who died descending from the summit of K2, the same year she became the first woman to conquer Everest unaided in 1995. The 30-year-old climber moved to Scotland in 1995 with his sister Kate and grew up in Fort William in Lochaber. Family friend Ian Sykes told BBC Scotland he was optimistic he would be found alive. "They are very much a mountaineering family," he said. "It must have been very tough for the kids growing up without their mum and I hope to God things are going to be OK in this case. It is very worrying." Kate Ballard posted a message on Facebook thanking people across the world for their "love and thoughts". "Please join with me in positive thinking that my brother and Daniele will return safe," she said. "Please all believe and trust that they will be OK."
Stefano Pontecorvo, the Italian ambassador in Pakistan, tweeted on Thursday morning: "Rescue helicopter to search for Daniele Nardi and Tom Ballard is flying and approaching area of Nanga Parbat where they could be." Mr Pontecorvo said the search would resume on Friday morning "weather permitting" and added: "Pakistan army pilots made some headway today. Very grateful for their total dedication." It has been reported the weather was poor in the area at the time the pair last made contact. A number of deaths have earned it the nickname of "killer mountain". Mountaineer Sir Chris Bonington told BBC Radio 4's Today programme it was a worrying time but people should not assume the worst. He said: "One mustn't write them off, there's still hope that they are alive and that they are OK, admittedly in very dangerous circumstances." Mr Ballard had been living in Italy's Dolomites mountain range with his father for the past few years and is "regarded extremely highly in the climbing world", according to online magazine Planet Mountain. A Foreign Office spokesman said it was in contact with Pakistani authorities regarding Mr Ballard's disappearance.